I can’t believe it’s been 20 days since the last Firefox picks post. I know you have been waiting for this one. So, here goes this weeks picks. Juice: If you are a power Internet surfer and do a lot of research, you might like this one. Juice intelligently delivers related rich media content to your sidebar based on the things you highlight in any page you are viewing. You can also bookmark and organize your content for current or time-shifted consumption. removing the cluttered materials. This one started as a nifty bookmarklet and add-on adds more functionality by adding auto-detect & auto-convert. It even has a iPhone 3g/iPod Touch friendly bookmarklet. KwiClick: Another add-on for the Internet researcher. KwiClick enhances the way you interact with your favorite services like YouTube, Google Maps, Flickr, Twitter, Amazon, Wikipedia, etc. For eg. you can search Google without opening another tab by just selecting and right click any word(s). It shows the results in a dedicated popup. Likewise you can play YouTube video while browsing or view Flickr pictures, Twitter updates, etc. SortPlaces: If you find yourself heading into ‘Organize Bookmarks’, you might notice those sort options aren’t permanent. This add-on takes care of it. You can sort your bookmarks with various options. Check it out for yourself to see what I mean. Desktop: If you have used Speed Dial add-on or used to Opera’s Speed Dial option, Desktop is very similar. This experimental add-on not only shows you thumbnail previews of your favorite sites but it also lets you arrange them like you would want to see it in on your desktop. You can create your own layout with drag and drop and it’ll remember it. Pretty cool, huh? I am not a big fan of the Twitter’s web interface and as my buddy @MattJabs would tell you, I’m addicted to the adobe air Twitter client Twhirl. But, at times I need to use the web interface, I’d only do so with Troy’s Twitter Script. It makes the web interface so much more useful with features like – nested replies, @mentions, custom search tabs, auto pagination, media embed, auto url expansion and much more. Looking for some Google Greasemonkey scripts? Sky Plus! is a must have for a fan of blue color. It is very pleasing to the eyes and pretty stylish too with some nice gradients everywhere. 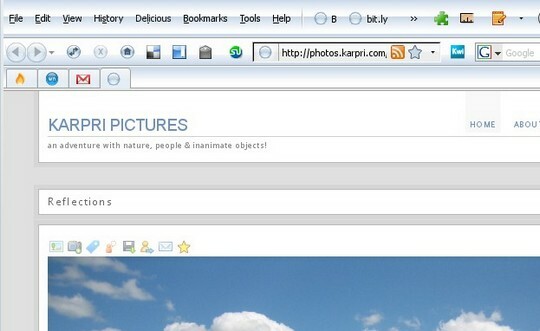 Hungry for more Firefox extensions, don’t get to stop by my Top Firefox Extensions collection. I am so happy I found this site. I am fairly new to all this and soaking up more and more each day. I especially like the idea of the SortPlaces – I am losing bookmarks all the time – this should really help. I love firebug. I use it to see the hex ID’s of colors I like to I can easily include them on sites I’m developing. It’s also a great debugging tool. Thanks for this interesting list, I may give some a try. As for TidyRead, I actually like the “cluttered materials”. To me it’s part of the impression what a website or blog is about. Of course it shouldn’t be overdone.